At least 19 people have been killed in two car bomb explosions in the Iraqi capital, Baghdad, officials say. The blasts happened within minutes of each other in the central Shia district of Karrada in the middle of the afternoon rush hour. The first bomb exploded outside a restaurant and a bakery in al-Andalus Square, and the second outside a court opposite a major police headquarters. More than 240 people have been killed this month in militant attacks in Iraq. 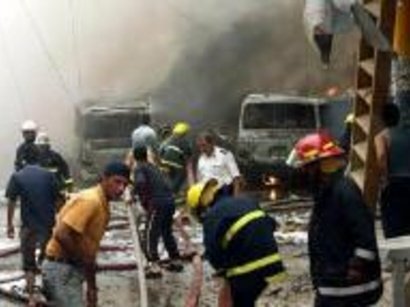 Sunni insurgents linked to al-Qaeda appear to have been behind most of the violence, including a wave of bombings and shootings in Baghdad and towns to the north on 23 July which left at least 107 dead. Clouds of black smoke rose above the centre of the capital on Tuesday after the latest bombings, which also injured more than 50 people. “We were in a patrol when we heard the first explosion. The second explosion hit another square, and we went to help,” Ahmed Hassan, a policeman, told the Reuters news agency. At least five policemen were also among those killed, officials said. An interior ministry official told the AFP news agency that the first attack had been carried out by a suicide bomber, while the local TV news channel al-Sharqiya said they had both been suicide bombings.